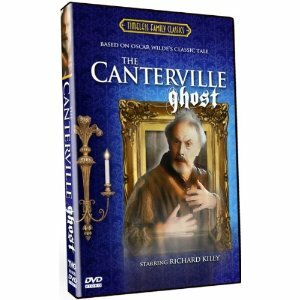 While rummaging through the DVD bargain bin recently I found "The Canterville Ghost" (1985) starring Richard Kiley, Jenny Beck, Shelley Fabares and a very young Brian Austin Green. This is a made for TV version, one of the many different versions of the spooky Oscar Wilde story. This is a good ghost story meant for a family audience with children at the center of the story. A family inherits the old English manor and soon after moving in learns the house is haunted by the ghost of Sir Simon Canterville. The little girl soon befriends the cranky ghost and sets out to break the curse of Canterville. The big old house is spooky and there's even the graveyard on the estate .This is one of those classic ghost stories that generations have grown up on.